Flour Mayhem: Baked Chicken and Dumplings and CUPCAKE cereal!!! Baked Chicken and Dumplings and CUPCAKE cereal!!! Preheat oven to 350. Place large pot with 4 cups of water on stove top on medium heat. Add uncooked chicken, poultry seasoning, adobo, kosher salt, and pepper. Once chicken is done -about 20 minutes- go ahead and remove chicken, set on plate and set aside. If needed strain all the floaters out of your broth. I did, some people don't mind, I however can't stand that stuff. ha ha Once strained, place back in pot, shred or dice chicken put that back in the broth. Mix cornstarch with a little bit of water, add to pot, along with butter. Bring to boil. Reduce heat, simmer for about 10 minutes. Dump that into 9x13 baking pan. mix Bisquick with milk, drop onto chicken mixture, sprinkle with pepper, and paprika. 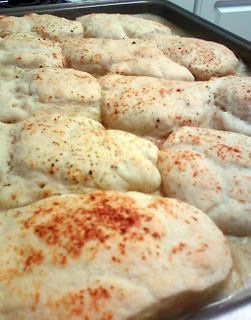 Baking 35-40 minutes or until golden brown. MMMMMM!!!! My mom and my sister told me about this new cereal they saw in the store. 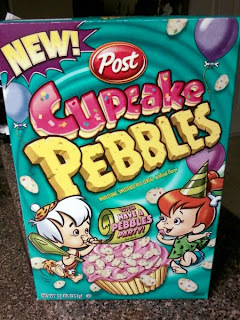 Cupcake Pebbles. Of course they thought of me when they saw it, I wonder why. Hmmm, hehe. So I had to get some, and I did. Boy it sure is tasty!! I had a bowl for breakfast today. Woo hooo :) When you open the box, it smells just like a vanilla cupcake. I was so excited, I poured a bowl, sat down at the table, and guess what?? INSTANT SMILE! I hope you guys run to the store and get some, you'll love it!! the dumplings are SO good, and so easy. You should make them Charlene!! Give Brennan kisses from me :) Mom sent me a pic with him holding the cereal when he was visiting her this past weekend..sooo cute! Oh my gosh, cupcake cereal! No way!! !